Tuesday evening, September 21st, the first lady joined President Obama at The White House in presenting the Medal of Honor posthumously to the sons of United States Air Force chief master sergeant Richard Etchberg for his courage and bravery while serving in Laos in March of 1968. Etchberg died saving three of his fellow airmen. However, his heroic deeds have been kept hidden away for over 40 years because his Vietnam-era mission was secret. At this event, the first lady blue and green Barbara Tfank dress with a sweetheart neckline and high-waist vertical pleating. She added her classic double-strand of pearls to this ensemble, completing her posh look. This style lookks great on Mivhelle! The long vrtyical pleating on the dress in flattering to any woman’s figure; the pleating presents the allusion of a longer body rather than a wider frame. This dress was in Barbara Tfank’s 2010 fall collection. Do you like this designer’s fashion taste? 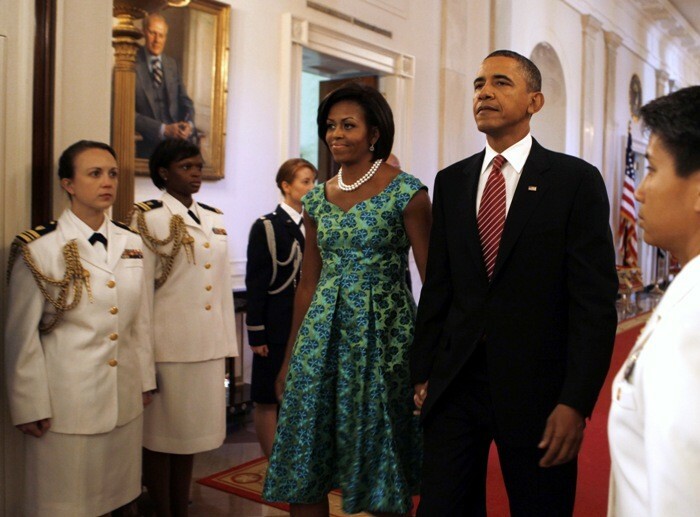 Does it fit Mrs. Obama’s style?